Many many thanks to all of you who over the past week took time to pre-order copies of the forthcoming book The Wainwrights in Colour. 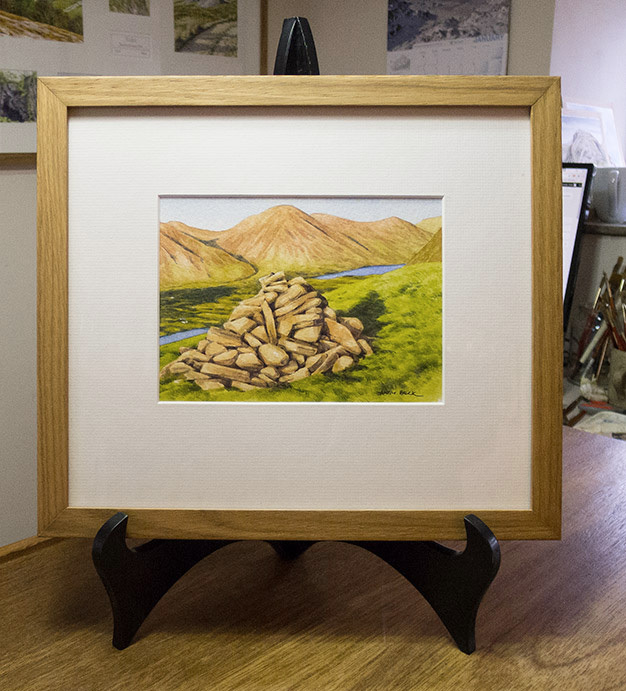 This morning I made the draw to pick out a winner of the original sketch of Burnbank fell shown below and the name drawn was Mr A Short of Cleveland. The winner has been informed and the sketch will be dispatched shortly. 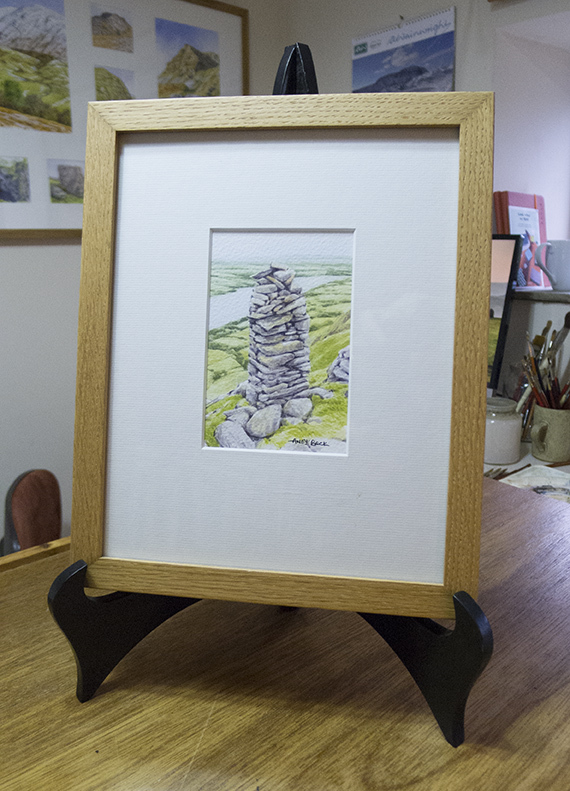 However, as the idea was so popular and successful I have decided to repeat the offer, this time with a small sketch from Bonscale Pike. This sketch does actually appear in the book even though Wainwright did not illustrate this tower in the Pictorial Guides. 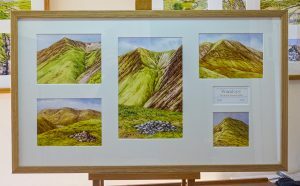 So once again it is a unique opportunity to be in with a chance to own an original work from the Wainwrights in Colour project. So how can you win this unique prize? You can now pay for the books and reserve the quantity that you require but by doing so your name will go into a draw to win the original paintings. I will also be able to prepare labels and packaging so that customers will obtain the book as soon after publishing as possible. Those who have already previously ordered will automatically be entered into this draw. This is my own version of a “crowdfunding” campaign to not only keep check on the ever growing demand for the 5000 copies of the book but will also help to pay the rather large printing bill which comes with printing such a large full colour 360 page book. As you probably realise, there is no big sponsor or backer for the production of this work so it all comes down to my hard work, quality of artwork and design and the generosity of those who have faith in me. To be in with a chance of winning the above sketch you must have fully paid for a copy of the book by 23.59 on Wednesday 25th January- don’t leave it too late! Whether you simply want to obtain a copy of The Wainwrights in Colour or maybe to support me further there are several ways to do so, some of which have never been offered before. The Wainwrights in Colour Book- to be published in March 2017. Each copy signed and numbered priced £39.00 to be collected at the launch weekend (no P&P costs) Click here to place your order now. 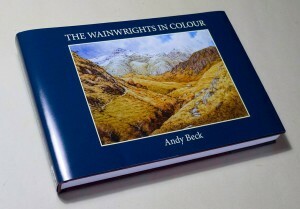 The Wainwrights in Colour Book. As above but includes a P&P cost of £7.50. Total £46.50 To order your copies click here. ALL copies of the book are personally signed and numbered by Andy. If you would like a short inscription in your copy then just fill in the details in the comments box on the checkout page. By pre-ordering the book you will be guaranteed of obtaining a copy. I cannot stress enough that this is a one off edition of only 5000 copies. Once sold out there will not be a re-print. A package of two limited edition prints from the book and a matching numbered copy of the book itself. These prints and books are sequentially numbered from 2 to 214 (see below). The prints are unframed for ease of postage. For the full details and how to order click here. 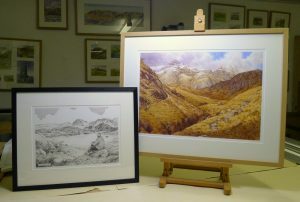 Followers of the website will perhaps have noticed that the original fells left unsold are now down to the final Eight. As part of this “crowdfunding” promotion anyone who buys one of these available fells will also get the opportunity to have a day out on the fell of their purchase with me. This personal day out will give you the chance to question me about all the intricacies of the project and the 10 year undertaking. To see the list of available fells click here. Whilst I will endeavour to personally acknowledge receipts of orders this may not be practical so please print off any payment transaction for your own records. If after placing an order for a copy or copies of the book you have a change of heart before the items are dispatched then email me and I will refund you in full.